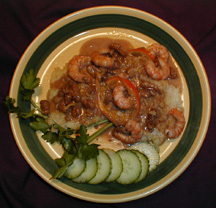 Served over rice, this is a savory and spicy shrimp dish full of crunch. Have your ingredients ready because this recipe only takes minutes. The Thai chili sauce can be found in most Asian markets or specialty stores and is a handy item to keep in your pantry for adding flavor to any stir fry recipe.